Maximising The Use Of The Fine Art Of Regrouping In Your Dental Office. Last night here in Sydney there was nothing on TV. I surfed the channels and in desperation settled on a station showing a tennis competition being played in regional Australia. The match was between Nadal from Spain and Federer from Switzerland. Surprisingly, the match ended up being quite enthralling. Firstly this Federer chap seemed to have the upper hand. Then the Spaniard took control and looked all points a winner before low and behold, if the Swiss guy did not just turn it around again to take control after three sets. And then, in a plot worthy of Agatha Christie, the Spaniard surged back to claim the fourth set and an early break in the fifth. What really interested me was how the Swiss guy used a medical time out of over six minutes in length at the end of the fourth set to go off court and receive some attention. For poor old Nadal, this was like a killer blow, because he had to put his momentum on hold for a long period of time while Federer was back in the change room having a Tosca and getting a massage on his right quadriceps muscle, so they said. It must have been a real challenge for Nadal to try to maintain his momentum, and although he took a lead early in the final set, he was not able to withhold a late challenge from the Swiss guy who returned revitalized and ended up winning the match. So what has this got to do with Dentistry? Have you ever had a team member answer your dental office phone only to be blown away by the demands and questions of the caller? So much so that the end result of that call is that the caller has NOT made an appointment with your office, and has decided to try to make an appointment elsewhere instead? How do you know that they are going to go elsewhere? If they did not make a time with you about coming in to your office, then they sure as eggs are going to try getting in somewhere else. You see, nobody in their right mind sits down one sunny afternoon and decides to call hundreds of dentists as an activity just simply to help them pass the time of day. So what this means is that everybody who calls your dental office is really a person in need of an appointment time with your dentist or your hygienist. And it is our job on the front desk answering the phone, to be make sure that we are able to get these callers in to our appointment schedule and help them with their dental problem. After all that is why they have called us, isn’t it? Not because they had a spare fifteen minutes so they thought that they would begin some random dental office survey of prices, treatments and modalities…. And that’s where this time out thingy used by this Swiss guy last night can be used in the Dental Office to help secure appointments. If the phone call is not going the way that you think it should be going then ask the caller for a time out period. Yes, ask the caller if they mind if you put them on hold for a moment. Of course Mrs. Caller will happily allow you to put her on hold, just for a moment. And it is in this valuable interlude time that you can take a sip of water, and regather your thoughts afresh and come back onto the phone with all cylinders firing and recharged so that you will achieve a satisfactory outcome for the caller. And that outcome is fairly, that we secure an appointment for the caller to come into our office and see our dentist. Because for them to go elsewhere is not the best possible outcome for both them and for our dental office as well. In sporting events these days more and more, the use of the time-out period is on the rise where it is being used strategically during the event to take some momentum away from the in-form opponent at crucial moments. So let us learn from our recreational colleagues. Let us learn to utilise procedures and protocols and systems available to us to the advantage of us and of our business. The use of a time-out, when answering the phone, is a classic example. Mrs. Caller will be a little out of position as a result of this said interruption. This will allow our dental receptionist the opportunity help solve Mrs. Caller’s issues and schedule her a time to see our dentist. If your front office people feel that they are missing out on scheduling some new patent enquiries then the tactical use of the time out during those calls could well be the correct medicine. The Undeniable Benefits Of An Outside Opinion. There’s no doubting that sometimes we do not see things that are common sense and logical. That’s where a second opinion is often invaluable. A second set of eyes that can see things that we for some reason are overlooking. Have you ever wondered where you put your phone down? Or where you left your car keys? Or what you did with your reading glasses? And yet another person can find these misplaced items in places where we’ve been looking. These scenarios are often quite common. In life, sometimes we do things in a certain way because that’s all we’ve known…. until someone shows us a different way and we wonder why we never ever thought of it that way? Or sometimes we carry on doing something one way and wondering what the better way may be, and why we can’t work it out for ourselves? And other times we hear about a better way, but for some reason just cannot seem to get that better way to work for us at all? This week one of my dentist coaching clients experienced a light-bulb moment. She asked her dentist friends and none of them were doing what was in the article. They’d not heard of it. None of them were familiar with the concept. And that is the concept of pre-blocking or templating the appointment schedule for the Dental Office. What was interesting to me as the coach of this dentist client was the fact that one reason that I thought dentists were not templating their schedules was because of the difficulty of implementation. In this client’s case it was because she was unaware of the concept. To her credit, and she is an exciting new client that I have only recently started working with, I know now that she did know that there must be a better way than what she was already doing, but she just had never been exposed to what that better way was. I’m really looking forward to helping her implement the processes of templating of the schedule in her office. I know what her outcomes and successes will be, because I was able to create a templated dental schedule in my own dental practice where the patients once believed that they were the ones in control of my appointment book. Remember, It’s Your Appointment Book. Either You Own It Or Your Patients Own You…. Have you ever called a medical specialist’s rooms to make an appointment? And that control of the schedule that the specialist has is the certain control that we need in our office to successfully manage our own dental schedule. Otherwise we find ourselves working late evenings and even on Saturdays and Sundays for patients who do actually have availability at regular times. And *THAT* is an attitude that is out there in the Dental profession, sadly. There is a science to creating a perfectly templated and pre-blocked appointment schedule for your Dental Office. And the process of implementation is not instant. It is, a teachable and learnable science. Multiply that increase in production over ten, twenty, or thirty years and then we are talking about significant income that is being left on the table when we fail to implement and fail to act on simple, learnable protocols and systems. The great dental offices that I know manage their time with efficient pre-blocking, where the practice determines who has what treatment when, rather than the patients cherry-picking appointments. However, effective pre-blocking can only be achieved when the front office team has the verbal and communication skills to be able to steer the patients into the appointments that are available. Mindsets and beliefs affect outcomes and results. And different results do not occur in silos. An open mind and a desire to improve and be better are the two biggest influencers on our ability to progress to a higher level and a better outcome. And if you do have them, can you as leader of your dental practice capitalise on them on your own? Or do you need to hire people to improve the skills of your team? Do you see all opportunity? Are you missing some of the glaringly obvious? Would an extra pair of eyes help improve your dental practice? One of the major reasons that businesses do not implement change into their customer service systems is their belief that the cost of change will be greater than the cost of making no changes. But it is a belief trotted out time and time again. Could you imagine how backward our world would have been had fear of change manifested itself successfully above the exhilaration of new frontiers and the discoveries of the great unknown? What if Columbus had never sailed off into the sunset? What if Armstrong had never ventured up and onto the moon? What if Steve Jobs had never dreamt of the iPod? I can’t believe how much squandered opportunity there is out there because of fear of change. The funny thing is that despite the fact with change, there is always the opportunity to go back and return to where you started with minimal disruption if you so desire. And I see this too. What are the issues with changing your levels of service? Some dentists believe that their patients do not want to be pampered or treated specially. Everybody likes to be recognised and to be appreciated. Appreciated as a person and appreciated as a customer. And the number one reason that customers leave a business and go elsewhere is because of apathy and perceived apathy by the employees and the business owner towards those valued customers. They leave not because anyone does anything wrong to them. They leave and go elsewhere because they believe they are being taken advantage of and are being taken for granted. I can remember in my practice one year when we rang patients who had not been in for a while to “reactivate” them regarding incomplete treatment and overdue hygiene visits. Due to apathy and due to lack of watertight follow up systems. How are your Customer Service Systems? Do you have patients like Molly Smith slipping through the cracks in your Dental Business never to return again? Because of your Customer Service Systems leaking like a sieve? Or are your customer Retention Systems watertight? Are they so complete and seamless that the only way that a patient can leave the practice is to pass away? What are the benefits of change for your business? Improvement to your Customer Service Systems will see your Dental Practice retain more patients. Your patients will keep their scheduled appointments. Your patients will cancel fewer appointments and reschedule fewer appointments because they will be so pleased to be getting their dentistry completed before it has the opportunity to deteriorate due to inaction. Your patients will be keen to bring their appointments forward because they do not want to run the risk of their necessary treatment not going ahead due to deterioration of their dentition due to time. As a result of having less cancellations and more kept appointments your other patients will begin to fit in better with this culture that you are trying to establish. You will appreciate your patients more because they keep their appointments and reschedule far less frequently. So you will feel appreciated. And so the feeling magnifies. How do we bring about change effectively? Change only occurs when we commit to the outcomes of change and acquiring those outcomes. When we do not commit to those outcomes it becomes “too easy” to surrender and relapse and return to our former place, which may not be a good place but is a familiar place just the same. Although the journey to the new place in the future may be uncomfortable it is a place where we know we must go. We must be committed to the vision of improved customer service. We must know what that end result will look like so that we can set our sights upon it. We need to have that vision of the improved destination so that our team can then become motivated to attain that improvement. The motivation follows the vision. Motivation cannot precede the vision. What must be the key driver must be the fact that the cost of regret, which is the cost of not changing, is far greater than the cost of change. We must always be striving for improvement of our Customer Service Experiences in our business. We can never rest on our laurels. Are You Truly Committed To Your Business? I had the pleasure last night of hearing Glen Gerreyn speak. And I have to tell you, if you’ve not heard him speak, or read his books, then you need to do yourself a favour and do so. His presentation entitled “Start a Revolution” was both inspiring as well as thought provoking. Here are a couple of my key takeaways from Glen’s talk tonight. This was an interesting perspective that I had not considered. And he was so right. Motivation is not the key ingredient in moving forwards. Motivation is easy. But without vision, without an idea of where you want to go and what you want to achieve, then motivation without direction is misguided. We need a clear vision of where we are headed and what we want to achieve. We need to make a decision about each and every task we are presented with.. Delegate the task at hand. Concentrate. We need to get the task done. Finally, my third takeaway was to commit. Glen said, don’t get motivated, get committed. My take on this was that motivation alone was not going to be sufficient to help us move forward with purpose. Only with commitment and making that commitment and sticking to that commitment would we be better guaranteed of worthwhile progress. So how does this apply to you as a dentist? You need to become better organised with what you focus on and how you allocate your time. And you need to make sure that you are committed to achieving what you need to achieve. Being motivated is not enough. So ask yourself this and answer yourself truthfully. Are you truly committed to the results that you are capable of with your dental degree, and your dental skills? How big is your want, your why, about getting to that end result, that vision? Because if your want is small, or absent, then you’re a wandering generality. You need to become a meaningful specific. Glen told us to become focused. Because “flow follows focus”, he said. We need to know where we are going firstly. 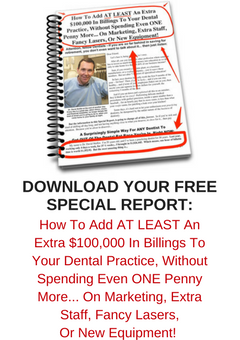 Is Today’s Casual Service From Your Dental Office Staff Detracting From Your Business? An article came across my desk this morning discussing the demise of service values at Sydney restaurants and the relation that this has had also with the demise of some fine establishments. Interestingly, this article follows on from where I wrote recently about a restaurant in the Southern Highlands where I felt that the waitress was way too familiar with my wife and me as diners. This article today indicates that this familiarity is creeping into Sydney. And I’d suggest that this over-familiarity is also creeping into other industries without consideration of the long-term effects of what is going on. This newspaper article pointed the finger squarely at the replacement of professional waiters with students and travellers. It’s funny because I know that as a regular diner at one of Sydney’s finest restaurants I always liked to tell the waiters there that when I retired from dentistry I wanted to come and work there with them, because I just loved the way they worked and their attention to detail as well as process. And I guess that’s it in a nutshell. Standards are dropping as we now start to see a shift towards a laissez-faire approach from the wait staff that we get lumbered with these days. And the wait staff do tend to be people on working holidays.. Which then creates a vicious cycle within itself. Because if the only applicants that restaurant owners can get for their wait staff are students and travellers on visas, then why would the business owners be motivated to be spending money on training and educating employees who by their very own definition are transient by nature. And in so doing we see the dilemma. Was this dilemma created in the first instance by business owners looking for less expensive labour in the first place? And by so hiring, it is the business owners who really have set the wheels in motion of what now seems to be a runaway out of control locomotive? Is this because the restaurant owners are going into these businesses undercapitalized? The article seems to feel that this is why corners are being cut. And the biggest cut is staff and service. And as I see it, that results in the biggest negative impact upon your business turnover and its profit. I’d go so far as to say that you CANNOT have a successful restaurant or successful business without having great people and great service. It is the great service that is the glue that holds the successful business together. Nobody wants to go to a business where they are treated shabbily. It’s not a duplicatable business model. How many Seinfeld style “Soup Nazi” businesses do you see out there? I’ve pointed it out recently that in dentistry, dentist business owners often have very little knowledge about how their front desk is being run, or how their hygiene appointments are being conducted and what is being said and what is being not said where and when around the dental practice. And so business just goes bumbling along regardless. The businesses out there that are serious about their customer service through their great systems and through their values and their culture are the businesses that are standing head and shoulders above their competitors. My thoughts are that with restaurants the demise in service standards has come along at the same time that the wait staff now attend each table for the bill settlement with the EFTPOS terminal rather than the good old days of back and forwards of the bill and the folder and the credit card and the signature, and the Tip. And it is the Tip, and the lack thereof these days that is probably driving down service. As diners, I’ve spoken to restaurant owners who refuse to ask their clients for a tip when handing the diner the EFTPOS terminal for settlement. And I’ve been in situations where I’ve wanted to tip, where I’ve expected to tip, and the tip facility and instruction has never been offered or requested by the server. My point here is that if the wait staff are not incentivised into the success of their tables and therefore the ultimate success of their restaurants by receiving a financial incentive [tip] from their diners, then long term there will always be more struggle for these restaurants than in a business that does focus on the numbers. And I’ve seen the same in dentistry. A team that functions knowing the customer retention numbers and knowing the practice financials will go out of their way to act on that information and help improve those numbers. When the numbers are not disclosed then the employees are left in the dark, and vagueness is created. Angus Gordon suggests that restaurant owners need to share some figures with their wait staff as to average spends required for the restaurant business to be profitable and to be viable. Again, as I say, you can’t feed your kids on applause. Everybody needs to be aware of the numbers required. Number of patients seen per week. Average spend per patient per day. Are we hitting our targets and goals? And then, are we rewarding our team for hitting those targets and goals. When waiters used to be tipped with cash, they were easy to incentivise. Nowadays, as process has infiltrated their industry, the ability to incentivise them is not there as much. Maybe the restaurant industry needs to take a step back on the automation and then upskill itself better on the original problem which was credit card security? In dentistry, the automation of appointment announcements, and the automation of patient SMS systems has seen a disconnect in those practices between the staff and the patients. And its all because some bright spark computer nerd thought that he’d invent a new system of automation, without realising that the automation was detracting from the business ‘s core vale of service and communication. And actually talking with the patient…. In the restaurant article, the owner of Catalina restaurant said that his restaurant treats patients like grown ups and is not succumbing to trendy casual culture. I know that Truitt Cathie would never succumb to that culture at his restaurants either. And maybe that’s why Truitt’s restaurants are far more profitable than others in their industry. As I say, there will always be a percentage of the population who want great service and are willing to pay for it. So why not seek out those customers and give them what they want? So that your business can survive, and thrive, in these variable times.